There are a huge variety of birds available as pets in Australia. Each variety has unique characteristics, colours, sizes, temperament and special needs so it is important that you learn and gather as much information as possible. This will help you choose the right bird for your needs and also cater adequately for the bird’s needs too. Some birds like handling but others do not. All birds are enjoyable to watch, listen to and have around. 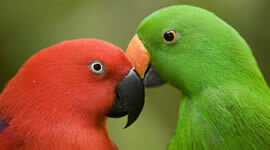 Some birds are great talkers, others have a beautiful song and some bring endless fun antics to each day. Learn all you can about the type of bird you are getting. Equipped with knowledge and understanding, you will have a better idea of what to expect. You'll then be able to provide your pet bird care it needs and the result will be maximum enjoyment. Please ask one of our veterinarians regarding a good health care routine. A well-designed and built aviary is the most satisfactory housing for birds, enabling them to live with freedom of movement and adequate opportunity for flight. Circumstances often dictate that birds are kept in cages, usually manufactured of metal with wire mesh screening. The minimum size of cage to house one bird will depend on the breed of bird. The cage should be positioned in a well lit, sunny area where the birds will have frequent human contact, and in which it will be safe to be released for exercise if possible. A portable cage stand permits the birds to be repositioned for their comfort. Appropriate perches of varying size must be provided as well as well-secured food and water troughs. The food and water receptacles should not be positioned beneath bird perches and any accidental contamination of the food and water by bird droppings must be removed immediately. At night the cage should be covered over to permit the bird to rest and to protect it from draughts. Should the cage be placed outside the house at any time, it must be in a position that is safe from predators - cats and wild birds - that could scare or directly injure the bird. Birds should not be left in the sun without shade and should be protected from overheating on hot days.